Teach Soap • View topic - New project showcase - Flaunt your stuff!! Post subject: Re: New project showcase - Flaunt your stuff!! Just some things I've been working on this weekend- gifts for my daughter's preschool teachers. You might recognize the hearts- I used soapylove's tutorial, although I'm not nearly as good at it! and I'm also still working on geting pics to show up too...so the links are above. First try I only got red boxes. I am utterly LOVING those writing soaps.... please tell me how you did them??? Also, do you have a link to the hearts soap tutorial? Tried to get your pics to show but I'm only getting a red X in a box too. I just bought Soapylove's summer issue. It looks very interesting! Last edited by redfishingirl on Tue May 26, 2009 9:27 am, edited 1 time in total. Those ice creams soaps are amazing... how in God's earth did you make them???? Love the ice cream soap! Maybe we can do a giveaway with your ice cream soap and my cupcake soap for a cake and ice cream giveaway. Serah's - Getting Clean Never Looked So Good! I've got some stuff to flaunt that are not cupcake soaps this time. (Sorry to the cupcake lovers in the forum.) 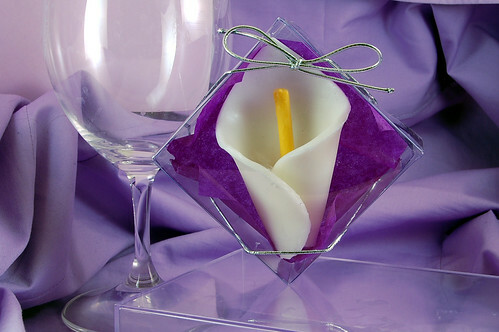 It's a calla lily soap favor and I have four different designs. This is just one of them. I need you to vote for your favorite to help the bride decide. Click to vote. I voted for this one. I like this one the best. It stands out and it looks classy.